Luxurious rooms that are designed for a narrow circle of guests require special attitude to planning and selection of décor. There is no place here for a large table, but additional mini areas are required so that it would be possible to talk to each other. The Classic-style dining room includes decorative elements, interesting techniques of furniture arrangement and decoration of the Interior. At first glance it may seem that it's too bright, but let’s take a closer look at the details. 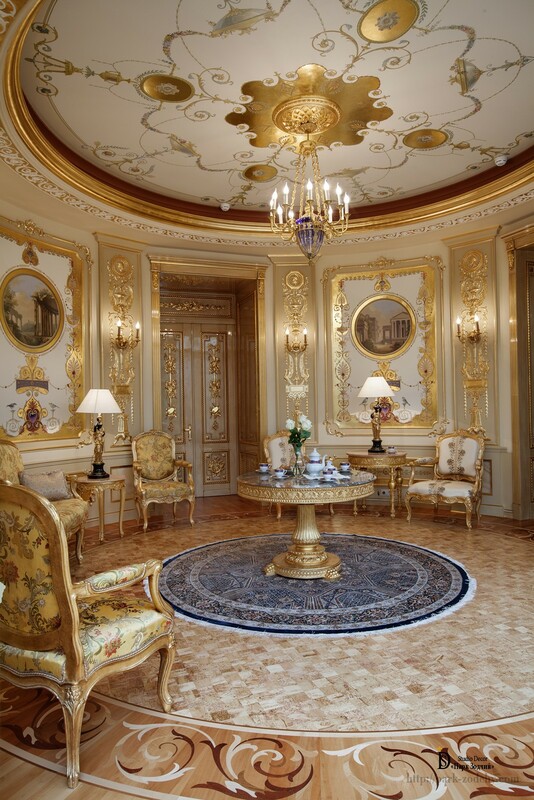 Non-standard form of the room has set the rhythm of decoration: table, carpet, parquet frieze, ceiling stucco moldings, ornamental paintings in the medallions on the walls match the round shape of the room. The main idea was achieving the union: between friends and relatives, uniting with beauty. Flowing lines create a sense of peace and unite several additional places for rest. Soft furniture sets with different upholstery make the room more pretentious. A few doors open the room. Due to the fact that they are located in richly decorated niches, there is no feeling of passing room. What is the most important thing in the dining room? Of course, the dining table. It became the basic element around which the Interior was built. It is supported by “junior fellows” – small tables with exclusive table lamps. All shades of blue are called colors for relaxation by right. The living room was not planned for ceremonial banquets or noisy parties. Therefore, blue carpet, marble countertop, elements of ornamental painting have been chosen to create a relaxing mood. At the same time, variations of beige and brown colors in a remarkable way complement the Interior. To accentuate the primary area, the central part of the floor is decorated with laconic pattern parquet. Artistic parquet resonates with the ceiling painting and combines rest areas. An interesting detail. Larger pattern of the floor is balanced by smaller ceiling paintings. On the one hand, it brings together the Interior, on the other hand, makes the Interior easier. Low-relief stucco moldings are artfully gilded, due to this, three-dimensional décor has been created. It not just decorates, shiny ornamental scrip stands in the foreground, figuratively pushing the walls, and even so does not overload the Interior. Ornamental grisaille painting on gold combines two techniques of decoration and looks very impressive: shiny parts are subtly intertwined with monochrome matte elements. Professionalism of the masters helped to create such a masterpiece, because any inaccurate movement may require alterations of the total work. In case of error, you cannot paste a separate fragment of gold, the fault catches the eye. 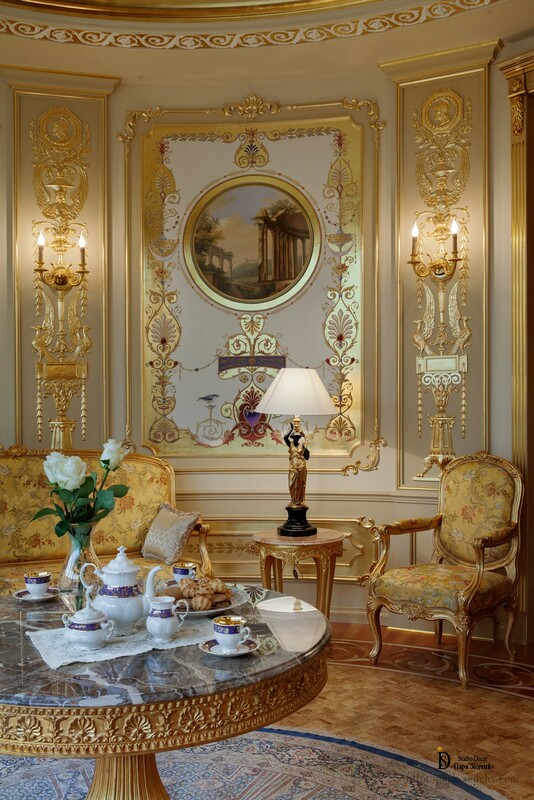 But experience and exceptional craftsmanship of artisans have allowed creating such a complex ornamental painting on gold, which has made the dining room inimitably beautiful.